• Appointments are required to help the program go smoothly and are limited to a certain number of animals at a time. • Clinics run weekly, bi-weekly and monthly depending on the county. • Financing may be available in your area for low-income families. • Prices/specials could change at any time. Also, some program funds expire as money runs out or as spaces fill up. • There may be additional charges for animals with medical needs. • Must have proof of rabies or attain rabies vaccine at time of surgery (It’s the law). Must be a Meade County resident. KHS S.N.I.P. Clinic transport: Surgeries are $40; Pit bull surgeries are free. Floyd County residents on assistance or who make less than $30,000/yr can qualify for a $20 spay/neuter. Assistance is available to Washington County residents in need. 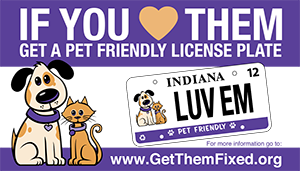 Indiana residents can apply through Spay-Neuter Services of Indiana for a reduced spay/neuter fee by going to http://www.spayneuterservices.org.